To help explain the process, we have taken the liberty to give a 12 step breakdown in UK visitor visa applications. You have selected the UK’s visitor visa. There are quite a few variations in this regard. The two most popular ones are either the Tourist visitor visa or the Business visitor visa. Effective August 2009, all South Africans have to apply for permission before being able to enter the UK. There are fortunately longer term visas which cater for frequent travelers. At this point, South Africans frequently make the mistake to beginning to prioritize flight costs. It is recommended that applicants not worry about flights though. Not until their visas are awarded. Based on our experience, we have witnessed that many neglect to consider the validity of the passports. If not the validity of their passport, the amount of pages available for visa stamps (for frequent travelers). Another important travel document that often catches South Africans (when its too late) relates to birth or marriage certificates. Passport validity (check when the South African passport will/has expired). Minimum 6 months validity required – based on the date of submission. Passport blank pages (check if there are a minimum of 2 consecutive blank pages inside the passport). Birth certificates (full birth certificates are required for minors). Emphasis is placed on government issued FULL birth certificates. “Abridged” birth certificates are not recognized for international travel purposes. Marriage certificate (for South Africans looking to claim travel benefits with EU or UK visa holders). If your passports are valid (and have sufficient blank pages) and your remaining certificates are in order, you can consider the ability to easily travel more feasible. The Pretoria division of the department of UK Visas and Immigration has a team of Entry Clearance Officials that deal with visa applications lodged within southern Africa region. Their decision making system is efficient and reliable. TLS Availability: specifies the chances of a being delayed in securing an appointment. Move Up Capacity: specifies the availability of Move Up to take on more cases (or not). UKVI Difficulty: specifies the risk of refusal. UKVI processing times from the date of submission is a standard 15 working days (3 weeks). For an additional £150 per applicant, these applications can be “fast tracked” to be processed within 5 working days (1 week). Attached below is a breakdown of the different UK visitor visa validity periods. These costs serve to demonstrate the standard expected costs. There are optional additional costs for other value added services, such as fast track. To find out more about the fast track services, Move Up is best able to assist. Different UK visas have different visa qualifying requirements. To demonstrate that applicants meet the UK governments visa qualifying requirements, South Africans are expected to present paper based evidence. Step 6: Where to Apply? The map below serves to show where the TLS and Move Up locations are. Please note though that Move Up’s Cape Town office services South Africans nationally (throughout the country) and internationally. Step 7: How to Apply? Step 8: Who to apply with? 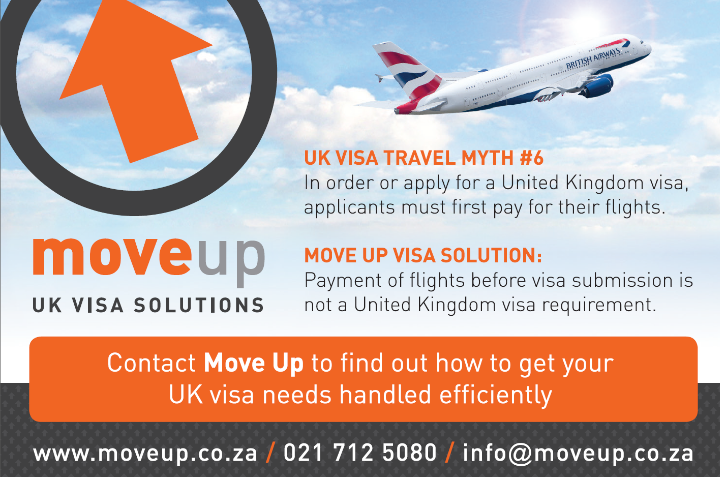 Besides sponsoring this website, Move Up (www.moveup.co.za) is a South African based immigration company that serves to help fellow South Africans in their UK visa applications. Move Up proudly specializes in all types of UK entry clearance applications for South Africans. Office hours are Mon – Fri (9am-5pm). Closed on public holidays. For needed face to face consultations, operating on appointment basis only. Please Note: Move Up are currently Cape Town based and provide visa assistance for South Africans both nationally and internationally. In 2012 alone we have helped South Africans in all 9 provinces as well as South Africans in USA, Canada, New Zealand, Zambia and Australia. This means even if you are not in Cape Town, we can definitely help in your UK visa application. No matter where in the world you are. Teleperformance is the current commercial agency appointed by the British government to handle the front of house for all matters relating to UK visa submissions. This simply means that Teleperformance is a specialized courier agency that serves to capture finger prints, take visa photos and then match the captured records with the applicants passport and supporting documents. Once the applicant (South African public) submits their visa application at Teleperformance (hands in their passport, completed forms and supporting documents), Teleperformance couriers the documents to a team of Entry Clearance Officials. At this point, it is important to note that there is no way around needing to deal with Teleperformance. It is compulsory for South Africans looking for UK visas to deal with Teleperformance. It is important to note that Teleperformance are not the decision makers (therefore visa submissions are not interviews) and that they are not sufficiently equipped with understanding of UK immigration legislation. Their often incorrectly given immigration advise has no understanding of legislation in place. UKIASA (UK Immigration Authority of South Africa) or ukiasa.org is a governing body that serves to protect the South African public from unethical immigration practices. UKIASA has standardized the UK immigration system and has set minimum expectations against those standards. UKIASA’s primary role is to hold UK immigration firms (and Visa Representatives) that practice in South Africa, accountable for their immigration advice given to the South African public. Further to this accountability, UKIASA’s standards also detail the level of expertise that a Visa Representative can give. Making sure that specialists provide expert advise and not ill-experienced making recommendations for cases they do not understand. This ensures that the South African public is correctly represented with UK visas that operate in the applicant’s best interest (and not the service provider/immigration firm best interest). Therefore, when it comes to applying for UK visas, UKIASA does not deal in the visa submission. Rather, UKIASA deals with Visa Representatives in South Africa. Different visas require different supporting evidence. Usually applicants have to show that they have sufficient supporting funds to cover the expenses occured in their travels. Taking into consideration that each person has unique backgrounds, the UK has implemented Immigration law which specifies qualifying criteria that each applicant needs to adhere too. In South Africa, we have Entry Clearance Officers based in Pretoria who process the supporting documents and make decisions based on the balance of probabilities. This means that the Entry Clearance Officers have to decide on applicants success based on the information provided in the visa application. Therefore supplying the correct information is key to obtaining a successful result. If you find that this visa information too much to digest and if you are looking for a trouble free application, you should contact Move Up’s team of UK visa experts. Office hours are Mon – Fri (9am-4pm). Closed on public holidays. For needed face to face consultations, operating on an appointment basis only. At this point it is important to note that you are not dealing with a biased system (like the US government have implemented). The UK government avoid discrimination to the best of their ability. We have taken the liberty to explain the process going forward from here. First and foremost, it is important to note that this is not an interview. You are not meeting with anyone that will be impacting the decision of your application. Therefore, you do not need to impress. You can relax and enjoy a friendly, efficient and well run visa submission process. The decision makers will be making their decision based on your supporting documents, immigration and criminal history (if applicable). Q: How do I cancel my application and get a refund? A: OK. So you have completed the online application and you have paid for the visa application (and booked an appointment). Now you have decided that you wish to withdraw your application. At this point, it is important to note that you realize that if you attend your appointment (and hand in your documents), you cannot cancel the application (without forfeiting the visa fee). If you wish to withdraw your application before submission, you can get your full visa fee back. The request for a refund needs to be done the online application (where payment was originally made). Q: I am running late, can I phone the Visa Application Centre to tell them that? A: No. Teleperformance deliberately does not have a local call centre for UK visa related queries. What is important to note though is that they will accept you on the day of your appointment (late or early). Q: How do I change my appointment date? A: The appointment can only be changed on the online application. Provision is made before the appointment. This means that the visa appointment can be changed before the booked time. What is important to note though, it is not possible to change the appointment once the appointment time starts or any time after the appointment. Once the appointment time starts, the time slot is considered finalized and changes are not permitted thereafter. Therefore changes to the appointment can only take place before the secured time slot. Q: What happens if I miss my appointment? A: It is just going to cost you a little more. £30 walk-in fee is charged for applicants that miss their appointment day. Based on our experience, having helped thousands of families through this process, we highly recommend not worrying. We have witnessed clients who have worried and we have witness clients that have not. In either case, we have concluded that worrying solved nothing. If anything, it made the transaction unpleasant. Fortunately, Teleperformance has made tracking of the process available. Click here to follow through to the Teleperformance website. The British government have also done a great job and have put together a way that applicants can be what the recent processing times have been like. This serves to create a realistic expectation as to how long it will take for the visa to be processed. Further details of the British governments recent processing times can be found here. A friendly travel tip, instead of checking each day, to see if the tracking facility has been updated, we recommend that applicants set a reminder for the date that it is meant to be awarded and then to move on with life. That way, time is not wasted on worrying or needing to check the process every hour. After the wait and you have hopefully received the email that says “a decision has been made” – with no further details of the outcome (standard practice) – the next step is to go and collect your application. After being notified that “a decision has been made”, applicants are recommended to go and collect their application the next working day. Therefore, if applicants receive notification on a Friday, they can go collect their application on Monday. The outcome of the application will only be determined upon collection. This is the last step. 12 out of 12 steps now completed. Congrats on making it through the process. At this point, we trust that the UK visa has been processed and applicants have collected their whole application from the applicable Visa Application Centre. Assuming the visa has been issued, applicants will note that their visa has a set start date and a set end date. This determines their permitted amount of time you are allowed to stay in the UK. In the event that the case has been refused, applicants are encourage applicants to contact Move Up (and forward scanned copies of their refusal letters). What can I expect at the UK Border? How do I move my personal belongings to the UK? What happens if customs seizes my things? How much cash am I permitted to bring with me (either going into the UK or going out)? Do I have to pay UK tax? We trust you have found this site helpful. We would like to thank our sponsor: Move Up – UK Visa Solutions for making this site possible. All the best with your UK travels.